You may remember that a while ago I bought myself some vintage prints, well here they are framed and displayed in all their glory in the shop. As you can see I have a green selection sitting on my desk at the moment but any colour scheme seems to suit them so next week when I change items around I don't think it will matter at all. Here are four vintage inspired pieces made from silk and velvet, all on wide toothed combs so you do need to position them in the right place to get the best look, I also put them on head bands. Each of these could be worn a.m. or p.m. it would just depend on your outfit. With so many vintage styled parties at the moment I make sure I have lots of styles ready to buy in the shop. Pop in and try some on if you live close enough.! Just finished and off to the races tomorrow. It's one of those tones that change in the light and can appear very different. Always tricky when looking for accessories. However help was at hand in the form of two beautiful shades of silk. This client also had a silk clutch bag made in the lighter silk of the petals and her shoes were almost the same colour. Once everything was tried on together the combination was perfect. Hope she backs a winner. It can still have plenty of structure and the brim can tilt back just the same as a blocked hat so there's no compromise on shape or style. This is an embroidered linen in apple green which has a matching wide slim clutch bag. 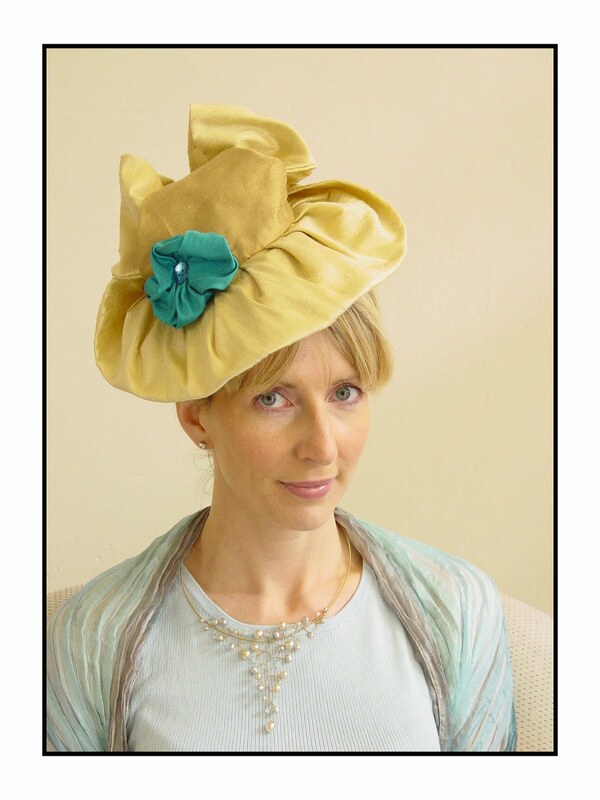 It has an oval brim wider at the side and shorter at the front and back with a pork pie crown. You can wear this hat for hours and hardly feel you have anything on your head. 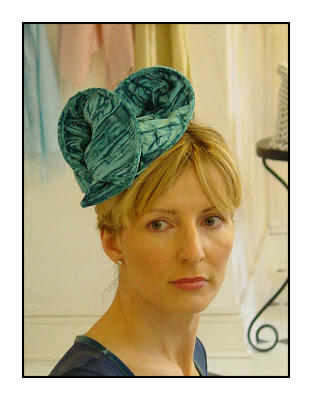 Silk is another fabric I use for similar shapes but you could use any fabric at all. So the next time you have a day at the races or an event where you want your hat on for a longer period of time think about something light and breezy. 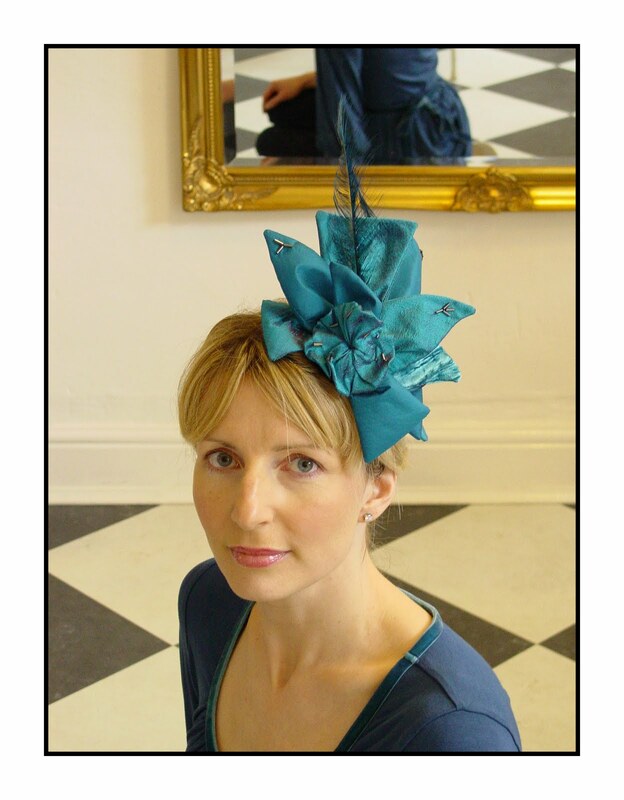 Almost everyone I know watched part of the Royal Wedding last week, I really enjoyed all the hats of course as well as the fabrics, shapes, colours and accessories. I wanted to have a vintage feeling to one of my shop windows just prior to the wedding and to achieve this, wrapped some silk around some mdf that had been cut into a dressing table mirror shape. Then I pinned pattern pieces, photographs taken by Shelly at Toast and a beautiful hand embroidered lavender heart by carolinewattsembroidery . On one side I have a hat block,scissors,pins,tape measure and threads with a sign that reads 'where design meets traditional skills'. 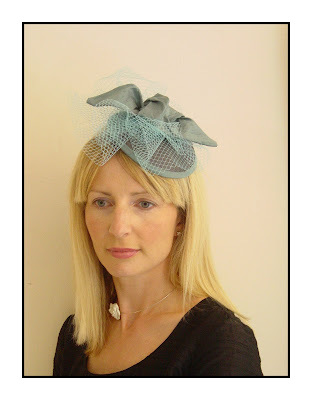 All the hats where of a neutral tone, two pill box, one with veiling, one made from window sinamay and a window sinamay brimmed hat with a silk organza crown. I did have some green foliage and a tulip but that wilted very quickly as it was very sunny. The only problem has been trying to get a great photograph through the glass.! 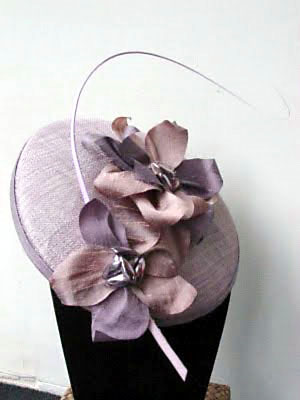 I am going to keep the display for another week but change the hats for bridal headdresses and accessories.